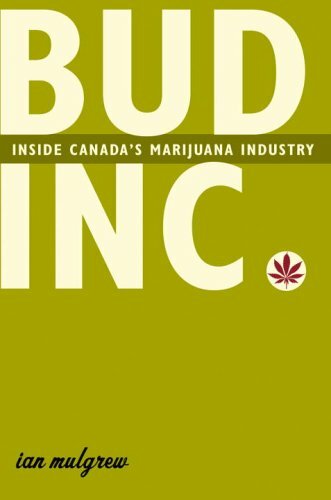 The Basics: Bud Inc.: Inside Canada's Marijuana Industry, Ian Mulgrew, 2005, 287 pages, hardcover, nominated for the National Business Book Award 2005. How I found it: It was recommended to me by Amazon.ca because I purchased The Golden Spruce (very good book, I recommend it). I also noticed it on the Halifax library's recent non-fiction acquisitions. What's it about? : It is supposed to be an expose of what the marijuana industry is really like on the inside, and to some degree it accomplishes that. However, I'd say it is more a book about the fight for legalization or decriminalization of pot. Either way, it is a fascinating look at an industry that most Canadians know little about. Did I like it? : Yes, I liked it. I'm generally for the decriminalization and regulation of the marijuana industry, which might explain why I sympathized with Mulgrew's arguments (though I'm not nearly as voracious about it as he is). I found the whole book rather interesting since it presented an alternative view the one the mainstream media gives us. The part I found most interesting was the section of the book devoted to the scandal surround the Da Kine Cafe, a cafe that openly sold marijuana on Vancouver's Commercial Drive in 2004. I lived on the drive at the time so hearing the inside story of what when on with that cafe was fascinating as an alternative to the media coverage the event received at the time. Will you like it? : If you don't support decriminalization, you probably won't like this book. Mulgrew consistently refers to the illegal status of pot as "prohibition" and makes comparisons with the prohibition on alcohol in the 1920s. As well, Mulgrew doesn't touch on the violent side of marijuana cultivation very much - bikers, Asian gangs, etc. get only cursory references and not in-depth examination. Mulgrew explains this away saying that those groups comprise about 3% of pot growers and most of the media attention, but while that might be correct, I think they still deserve investigation. Pot is big business in Canada and when/if it becomes legal there will be some big opportunities there. But don't take my word for it: Editorial reviews, mixed reader reviews. Unfortunately that's all I can find besides highly biased reviews from both sides of the drug war debate. 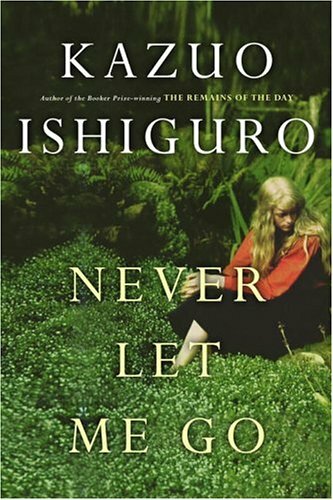 The Basics: Never Let Me Go, Kazuo Ishiguro, 2005, 263 pages, hard cover, shortlisted for the Booker prize in 2005. How I found it: When I was in London last February it was one of the books being advertised on billboards in the tube (because the Brits actually read). Amazon.ca also recommended it to me because I had read Alligator. What's it about? : I don't want to give away too much since this is one of those books where little bits are revealed as you go along. It is enough to say that it is set in England in the 1990s and concerns a group of kids growing up and coming of age at a special academy for clones destined to become organ donation machines. (Sorry if I've said too much and ruined the book for you.) It is science fiction, but it is literature science fiction, along the lines of The Handmaid's Tale and just as well written too. Did I like it? : This is the first book that I've read in awhile that I just couldn't put down. Ishiguro writes in a succint, yet beautiful style that I love. He also avoids giving too much detail about his alternative reality scenario so that the reader doesn't question it and accepts it in the same way that his characters do. The only thing I didn't like about it was the fatalistic attitude the characters seemed to have; they all accepted their fate without question or attempted rebellion. Will you like it? : The story is compelling, the characters are easy to relate to, the premise is not too far fetched and it is an exceptionally well written book. I think you will like it, and I guarantee you won't hate it. But don't take my word for it: Most online reviewers liked it, the major newspapers, including the Sunday Times, had nice things to say, as did Salon.com. 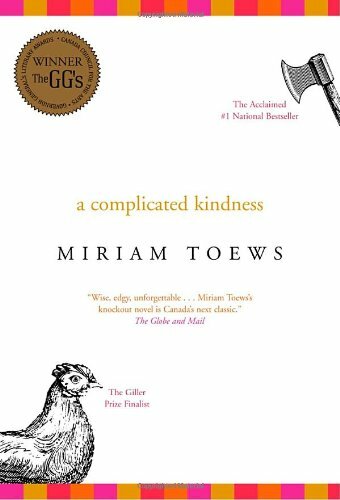 The Basics: A Complicated Kindness, Miriam Toews, 2004, 246 pages, paperback, winner of the Governor General's Award for Fiction, nominated for the Giller Prize, champion of the CBC's Canada Reads 2006. How I found it: Despite all the acclaim this book has received, I don't remember hearing about it. I picked it up in our local used bookstore because it had the GG nomination sticker on it. What's it about? : A teenage girl growing up in a small Manitoba farming community that is dominated by the ultra-conservative Mennonite church. Like most of the Canadian novels I have read recently, this one also involves a very troubled family. The protagonist, Nomi, is caught between the old ways of community and the pull of the modern world. Toews is said to have based the book upon her own coming of age in 1970s Steinbach, Manitoba (which I visited last summer and went to the Mennonite Heritage Village). Did I like it? : As a novel, I like the book. It was well written in an interesting and youthful style and I found myself relating to Nomi, despite her immaturity. However, I did have a few problems with the book. It depicts a very conservative, regimented and fundamentalist society of Mennonites who participate in shunnings and excommunications. I had a hard time reconciling this portrayal with the Mennonites that I know who are some the best, most caring and selfless people. They are much more moderate and modern than what is depicted in Toews' novel, but I suppose times have changed. I would be interested to see a moderate Mennonite review this book. Will you like it? : It is a difficult and heart-wrenching book to read, but that is what makes it good. It's critical recognition is well-deserved. I liked it, and I think you will too, but I will offer one disclaimer: it was both a Heather's pick (Chapters) and picked by O, Oprah's magazine. I generally am not a fan of those types of books, but I did like this one even though I kept waiting for the revelation (that thankfully never came) that one of the characters had been molested. It's that kind of Color Purple/Wally Lamb/book club-style book. But don't take my word for it: Readers on Amazon.ca seem to think it's boring, critics love it, a reviewer on popmatters.com seems to like it. How I found it: I read and liked Wilson's Swamp Angel in an undergraduate Canadian Literature class so when I ran across this book in The Last Word, a local used book store I picked it up. What's it about? : Somewhat of a coming-of-age novel about a young Vancouver woman and her troubled family in the 40s and 50s. The protagonist, Ellen a.k.a. Gypsy is a refreshingly forward and independent woman for her time. Did I like it? : Wilson's work always has a unique feel to it, a sort of undertone of melancholy, that for some reason I really enjoy. She writes well and I feel that she is underappreciated compared to other better known Canadian female writers. The book is a short easy read, but is full of emotion. I liked this book and was happy to rediscover Wilson's work. Will you like it? : If you are a fan of slightly feminist literature or woman authors, you'll like it. Ethel Wilson's work is definitely an essential part of the Canadian feminist canon and should not be missed. Also, if you love Vancouver and the Gulf Islands, and miss it like I do, Wilson's descriptions of the area, including her love for arbutus trees, will transport you there. But don't take my word for it: Editorial reviews from Amazon are all I can find. 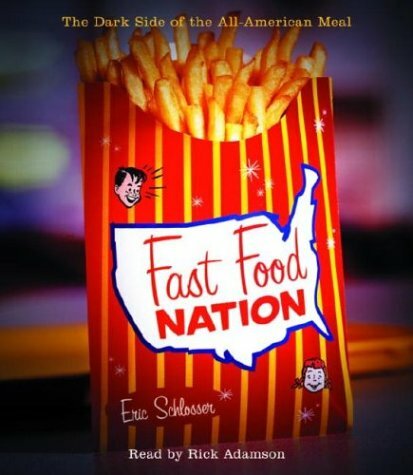 The Basics: Fast Food Nation: The Dark Side of the All-American Meal, Eric Schlosser, 2001, 356 pages, based on a series of articles for Rolling Stone in the late '90s. How I found it: I had heard of this book elsewhere but I recently watched Morgan Spurlock's Super Size Me which includes an interview with Schlosser as an bonus feature on the DVD. After hearing him discuss the dangers of ground beef (which was already a nemesis of mine) I knew I had to read his book. What's it about? : A critical look at the fast food industry that includes everything from the effect of fast food on urban sprawl, eating habits, farming practices, slaughterhouses, minimum-wage workers and more. Schlosser exposes things you never knew about the fast food industry to the point that it starts to sound like one big conspiracy theory, except that you know it is real. Did I like it? : I really enjoyed this book. Unlike some of the anti-establishment books I have read lately (i.e. No Logo, The Rebel Sell) Schlosser's book seems to be grounded in fact, not snap judgments and actually presents a section of practical solutions at the end of his book. As well, it was easy to read (except for some of the more grisly meatpacking sections). The only downside to the book is that it is very specific to America - I was left wanting to know if what Schlosser wrote is applicable in Canada. Lately I have been thinking more and more about what I put into my body and Fast Food Nation definitely strengthened my resolve to make better choices. Definitely another step back down the road to vegetarianism. Will you like it? : Everyone should read this book if they eat meat or eat fast food. Once you know you can decide for yourself what kind of choices to make. At times Schlosser has a bit of a left-wing (anti-Republican) agenda he likes to push, but if you can ignore that, you'll get lots of out the book. This book is written by a respected journalist in a well-researched manner. While it sometimes uses scare-tactics to get the point across, the point is an important one that you'll be glad to learn. But don't take my word for it: Amazon's reviews (reader and editorial), NY Times review. 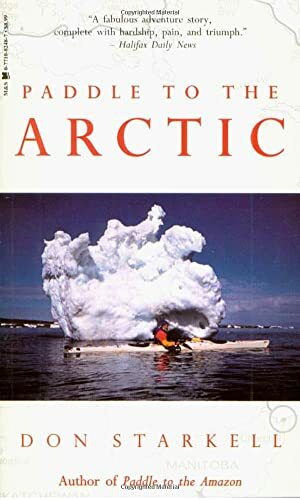 How I found it: I had read Greg's copy of Paddle to the Amazon, which is about Starkell's earlier paddling adventure from Winnipeg to the mouth of the Amazon River by canoe. I quite enjoyed that book so I thought I'd like Starkell's other book as well. What's it about? : Starkell attempts to be the first person to paddle the Arctic from Churchill Manitoba to Tuktoyaktuk NWT. He travels mostly alone, but partly with his female friend (girlfriend?) Victoria Jason. Fifty-nine year old Starkell is an experienced paddler but he still faces many challenges in his journey including hypothermia-inducing icy waters, polar bears, storms and sea ice. I won't tell you what happens though - you'll have to read it to find out. Did I like it? : As far as adventure travel books go, it was okay. It was certainly a compelling story and a quick read. However that was mostly because a lot of the time Starkell is an idiot and takes way too many risks leading to some tense situations that make for excellent reading. It was also refreshing to read a modern account of travel in the arctic. I'd read a bit about the Franklin expedition (and the Shackelton expedition to Antarctica) but obviously times have changed and equipment and technology have improved. Starkell travelled in the early 90s and repeatedly states that he would have become hopelessly lost without the brand-new technology of his GPS. The one thing that really bothered me about the book was Starkell's attitude towards his sometimes companion Victoria Jason. If you have watched any couples on reality television (such as the Amazing Race) you know that there is a certain type of North American man who is so driven and competitive that they treat the women they love like baggage/crap and expect way too much of them. Starkell tells the story from his side of it and apologizes for the way he treats Jason, but I still get that vibe from him and like him a lot less than I did in his Amazon book where he treated his young sons as near equals on the trip. All in all, Starkell comes across as a bit of an a-hole, but I guess it takes that type of personality to be successful that these sort of adventures (See Colin Angus for example). Will you like it? : If you like adventure travel books Starkell's are a must read. He accomplishes some pretty amazing things and lives through incidents that would have killed other people. If you've never read adventure travel books his are also a good place to start. They are Discover Channel-style sensationalism at its best and if that is what you expect from adventure travel books you won't be disappointed. But don't take my word for it: Editorial and real people reviews from Amazon.ca, and a review of Victoria Jason's book, Kabloona in the Yellow Kayak, from her part of the expedition and some web discussion of Starkell's book and his character. How I found it: Most people have heard of this book as it caused quite a stir when it first came out. Greg bought a copy of The Rebel Sell, a reply to No Logo, awhile ago and since that book criticized Klein's book, I thought I should read it. What's it about? : It examines how brands rose to power, the tactics they use and how people are trying to break them down. It is about a lot more than that as well including the ins and outs of the out-sourced garment industry, the evils of Shell's business practices and the effect that brands had on Klein's young adulthood. Klein has tried to write an all-encompassing guide to critiquing brands but she has gone way off topic at times in her activist quests. Did I like it? : Not really. It was an interesting read but she didn't seem to offer many solutions besides 'culture jamming' (but she harshly criticized Kalle Lasn's Adbusters so I don't know how she expects the phenomenon to become better known). The section on the realities of the garment industry and the explanation of why and how major companies out-source their production was really interesting, but quite off-topic and would have done better in a separate book devoted to that topic. No Logo was published in 2000 and it appears that most of the research was done prior to 1998. This means that the hip name-dropping and brand-dropping that Klein engages in is quite dated and makes Klein look like quite a poser instead of the cool-hunter she is trying to be. While I agree with the some of Klein's general sentiment, I still didn't really like the book. As well, there was so much going on in it that by the end of reading it I wasn't even sure if I remembered what I had read or what the general message was supposed to be. Will you like it? : Probably not since even if you agree with Klein it will depress you. But, that said, you should still read it - it's good for you. There are a few sections that are quite eye-opening and informative. If you can ignore Klein's bratty know-it-all twenty-something tone you just might get something out of it. This book is not perfect but it is one that needed to be written and has hopefully informed some people's choices. But don't take my word for it: Editorial reviews, real people reviews.